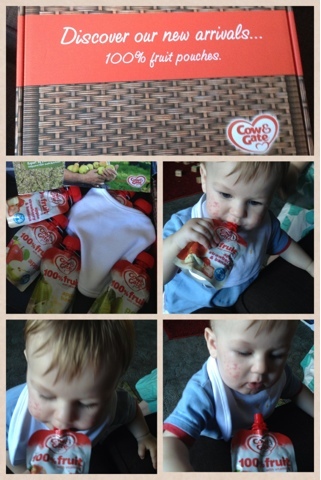 We were recently sent an exclusive tasting box from Cow & Gate to review on behalf of Netmums. Zach has already begun weaning and we are doing a mix of puréed food as well as solids. It's been very hard with him being dairy intolerant having to ingredient check everything before preparing his food and buying overpriced products from the free from aisles. So first of all I have to say how happy I am that Cow & Gate are one of the few companies that actually state on their packaging whether or not their products contain gluten, egg or dairy. Of course being '100% fruit' I wasn't expecting anything but fruit in them but was still pleasantly surprised at the clear markings saying so. I'm always on the lookout for new foods for Zach to try. The only fruits I can get him to try when preparing myself are strawberries and blueberries so was glad to see the large choice of flavours in the fruit pouches so I could get him to try them all. I've given him the vegetable based pouches before which he loved so recognised the pouch as being food and was very excited to try it. In fact he ate it straight from the pouch without making any mess! There was none wasted he seemed to really enjoy it. We've already gone through all six of the flavours in the tasting box and all six proved to be very enjoyable. As a mum it makes me happy knowing that I am giving my baby a naturally made baby food. There are no unnatural ingredients in the Cow & Gate pouches and all the fruits are grown away from contaminants as the ingredients are grown especially for use in baby food. Also one pouch contains '1 portion of fruit for a 1yr old' and 1/3 of a small child's daily vitamin C requirement. The sugar content is fairly high but they are all naturally occurring sugars and I'd rather he get his sugars from fruit than any sweets/biscuit products. I am a member of the Netmums Blogging Network, a unique community of parent bloggers from around the UK who have been handpicked by the Netmums team to review products and brands on their behalf. I have been paid expenses and supplied with a product sample for this review but retain all editorial control. All my Netmums Reviews will display the Netmums logo within the post.